All Foodies and Food Bloggers take note! Next time, do think twice before you want to make a scene or complain in a Restaurant, especially in Fast Food Outlets. You might be beaten with iron rods or get a few punches from the staff! ha ha ha ha! Unless you are a Karate or other Martial Arts expert or you are like Sifu Ip Man (Bruce Lee's Sifu) who can beat 10 person at one go; then you can go ahead to make your complaint. LOL! Marinade chicken with nam yee, Chinese rice wine, tomato sauce, pepper and egg white for around 1 hour. 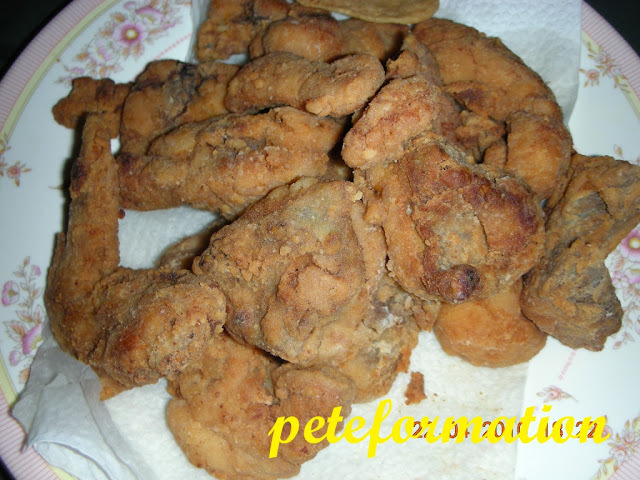 Coat chicken with flour and deep fry them till golden brown. Serve the 'Karate Fried Chicken' while still hot and crispy'...........Mmmmmmmm, this is a Fist Licking Good recipe.....ha ha ha! Muahahaha! You gave such a famous name to your dish, KFC!! Er...Will I get that nunchaku free if I visited you for KFC? Wonder what's the outcome of this KFC issue... heard Internationally known liow..
coming back to the namyue chicken, my mum loves to marinate them and fried them this way too..
nice name! i dont know karate..so how? i think just better stay at home and eat karate chicken instead!! saving this recipe, never used fermented bean curd, it's time! btw .middle left white cat in photo with black and white head! Muahaha...Kungfu Fried Chicken also can...but it does looks alike KFC original flavor. Very good looking fried chicken! lol! You are pretty safe, you can make fried chicken yourself if you are challenged by their chefs. Oh gee its the talk of the town now. If you wanna be fisted instead of feasted try Karate Fried Chicken. I hvn't tried this kind before..
hahaha, love your KFC fried chicken...any hot & spicy version? hehehe..
and what's wif the Bruce Lee's. Thanks for the fried chicken recipe. It seems you have a unique recipe for the breading.